New York City is set today to regulate so-called "crisis pregnancy centers" to prevent them from lying or misrepresenting themselves to women. These centers, run by opponents of abortion, represent themselves as medically licensed even when there's no nurse or doctor on the premises. As an editorial in the Times puts it, "With examination rooms, and staff members dressed in medical attire collecting insurance information and administering pregnancy tests, ultrasound exams and sonograms, these centers create a phony impression that they are licensed medical facilities." The bill, which is backed by city council Speaker Christine Quinn and New York mayor Michael Bloomberg, would force the centers' famously vague ads to disclose whether they have a licensed medical provider, and also say whether they'll refer women to other services, including emergency contraception and abortion. 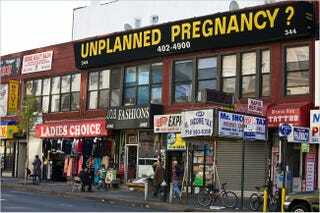 Its sponsor, Jessica Lappin, told NY1, "If you are purposely setting up shop across the street from Planned Parenthood, hiring workers to lure women in, and tricking them into thinking they are somewhere that they're not. And then, on top of that, making them believe they have seen a doctor when they have not...that is so dangerous and that is not something we are going to allow in this city." Operators of crisis pregnancy centers obviously oppose the bill, as does Archbishop Timothy Dolan, both of which said their free speech was being violated. At a press conference held just now, Quinn said, "If you hide what you do, you must believe you can only do what you do through deception." Sadly, New York is hardly representative of the tide, nationwide. Just last week, the South Dakota House of Representatives passed a bill that would actually force women to go to a CPC before having an abortion, an unprecedented encroachment. In Arizona, state legislatures passed resolutions expressing support for CPCs. So at a time when so many other local governments are rolling back women's access to safe and honest medical care — not to mention the House trying to do it nationally — it's nice to have some allies in positions of power. Update: The bill has passed, overwhelmingly, 39-9-1.